Carlow University appears in our ranking of the Top 15 Online Master’s in Forensic Accounting. At Carlow University, students may pursue undergraduate finance degrees in accounting and business management. At the graduate level, the available degree is the Master of Business Administration. All three are offered on campus, but only the MBA is offered online. Undergraduates may minor in either accounting or business management. Students who major in accounting may concentrate on traditional or forensic accounting. Typical classes in the accounting major include Introduction to Financial Accounting, Business Ethics and Social Responsibility, and Legal Aspects of Business. The degree includes 61 credit hours of finance and business courses and 59 credit hours worth of core courses. The Business Management degree focuses not only on business but also on Women’s Studies. The role of women in business is core component of such study at Carlow University. Students in this program are allowed to accelerate through it if they attend Carlow University for their MBA. The MBA program highlights values as part of its core philosophy. Rather than ruthless “sharks,” Carlow University prides itself on educating and training empathetic business people who recognize others’ dignity. The university is named for the city of Carlow, which is in Ireland. It was founded by the Sisters of Mercy in September 1929. The university’s original name was Mount Mercy College. The university originally only admitted women, but after the Second World War, men were admitted for the first time under the G.I. Bill. The university did not have on-campus housing until 1961, and prior to that point, students lived in boarding houses on downtown streets near the university. In the late 1960s, Carlow University offered its first courses in black studies. In the 50 years hence, the university expanded both its curriculum and buildings. 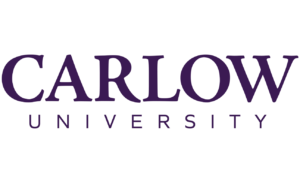 It adopted the name Carlow University in 2004. Despite its expansion, the campus is snug at only 17 acres. U.S. News and World Report ranks Carlow University No. 105 in the North Region. The school is nearly 90 percent female. Undergraduate students must take either the SAT or the ACT to apply for Carlow University. Although there is no minimum requirement for either, students who score less than 1,000 on the combined SAT, not including the writing portion, or 21 on the ACT should retest before applying because of the competitive nature of admissions at Carlow University. Students must also rank in the top 40 percent of their class and have earned at least a B, or 3.0, average on the normal slate of 18 college-prep credit hours. Graduate students must have a bachelor’s degree from a regionally accredited university or college in the United States or a foreign equivalent. They must also have achieved a B, or 3.0, in all of their previous coursework. Finally, based upon the program they choose, students must meet all of the specific requirements for matriculation. In either case, letters of recommendation, interviews, or other items may apply, so it’s best for students to contact the university to ask about any other requirements. At Carlow University, students of all levels can qualify for college credits for life, work, or both experiences, but they must test out of any classes they wish to skip. International students must provide proof of English competency using any one of the approved tests. Tuition at Carlow University is $28,788 per year. Room and board is $11,442. If a student wants a single, it’s roughly $5,000 more. Including assorted fees, the total annual tuition for undergraduate students is $40,896. Part-time undergraduates pay $916 per credit out. Graduate tuition costs $850 per credit hour for the MBA. Other programs cost upwards of $1,000 per credit hour. Veterans receive generous benefits that might even cost them only $500 per semester for their education. The financial aid process begins with the Free Application for Federal Student Aid, or FAFSA. Students and their parents fill out this form with all of their relevant income and assets data. From these data, the school and the government will jointly determine a student’s eligibility for the various forms of financial aid. These forms include grants, which include work-study, scholarships, and loans. The loans may be subsidized or unsubsidized. Subsidized loans mean the student doesn’t have to pay interest while enrolled. Of course, students may also apply for private financial aid whether it’s a loan from a local bank or credit union, merit-based scholarship from a private foundation or other entity, or a grant from any number of institutions. Generally, any private monies the student receives will affect the amount of need-based financial aid for which the student is eligible. Still, many students apply for different forms of aid. International students who want to participate in a work-study program need to have all of their immigration paperwork in order, including any work visas, prior to applying. Many grants and scholarships come with academic requirements attached. If such is the case, and a student does not meet those requirements, then the aid may be reduced or even taken away entirely. In the case of a grant or scholarship, the money already awarded might be converted to a loan that must be repaid. In the worst-case scenario, the loan would be unsubsidized, which means that it generates interest while the student is enrolled. Not only that, but it also generates interest on the interest. To find out anything about the FAFSA or any of the other aid forms or processes, students should contact the Office of Financial Aid. Carlow University has been a diverse learning environment for more 90 years and is not planning on changing that.